- at that point added the sentiment using my favourite Memento 'Tuxedo Black' ink and a 'Happy Easter' sentiment from Stamping All Day. They have a lovely variety of sweet sentiments - HERE. - then just stuck the image panel onto the label and added a lemon ribbon tie (using thread to pull the ribbon through the hole). Narrower ribbon would have been better but at that point I was on a mission and had no wish to hop around our local Hobbycraft! In the end, these were made with care and love, for sure. And I know I've said it before - but I have a swatch of all my SU card stock, which is how I can put a name to SU snippets! First of all - Happy Easter everyone! 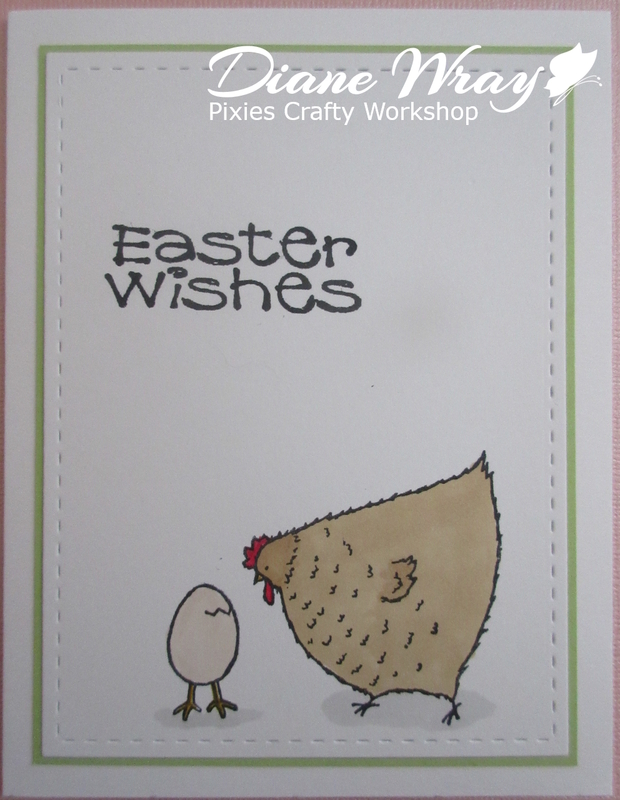 I needed a couple of last minute Easter cards earlier in the week - and rustled them up in about an hour. A record for me. - coloured the chicken and egg using Pro markers and also Whispers markers for the very fine bits such as the chick's legs. I do have some Letraset Extra Fine Nibs for Pro markers but was in a hurry! 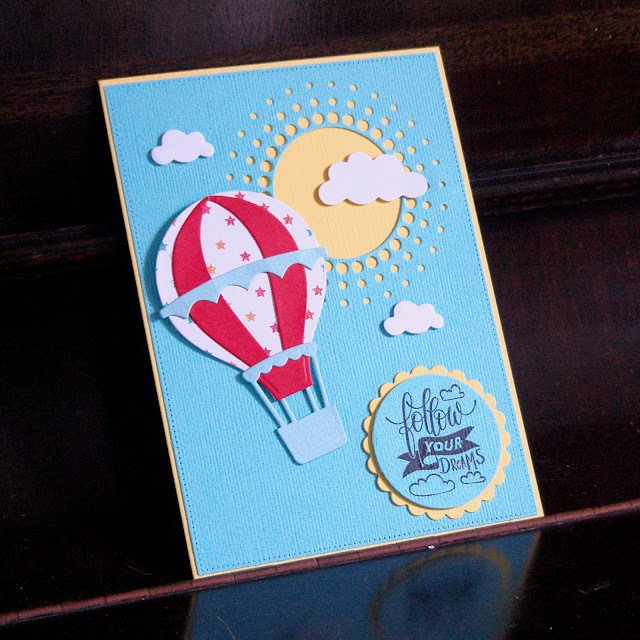 - then glued the layers onto a card front - all done! I really like the quirkiness of this SU set of stamps - always makes me smile. I do so love this adorable little Easter gift bag, made by Kath! Such a great way to use snippets on the cute bunny and other decorations - someone will be thrilled with this for sure! This absolutely had to be one of my picks! I totally love the design, great way to use up snippets. And the image is just wonderful - DO hop over to Meghan's blog and you'll see a perfect, absolutely matching, photo there of Meghan's niece and nephew. Brilliant! And, as always, such fabulous colouring of the image too. 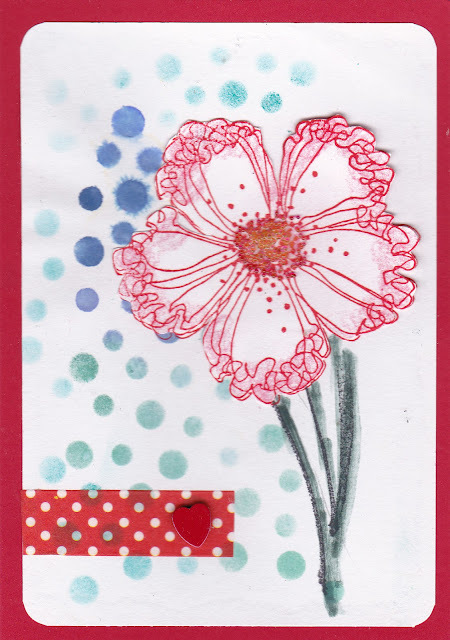 I really love this card, made by Glennis. Such a pretty background and the flower is stunning! I know the flower was stamped onto a snippet of white card - I bet most of us have loads of little white snippets we can't bear to throw away! And the final touch of the washi tape and heart is just perfect! 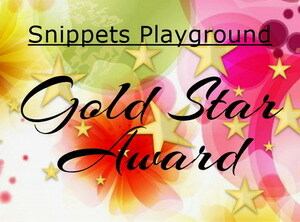 No new Playmates this time, although we had a total of 58 entries - yay! Well done Liz! I think you'll get a good bit of use out of the cover-up die especially. Please send me your address, with your full name at the top as well so I can copy and paste or just write straight from the email onto the envelope - for speed and ease. It's also confirmation that you still would like the prize of course and I'll post your prize once I hear from you. Please put Playground Winner or similar in the subject line of your email in case it drops into my junk mail. Email address is on RH sidebar as always. Remember folks, there's still almost another week to run on Challenge #350 - you can find it HERE. 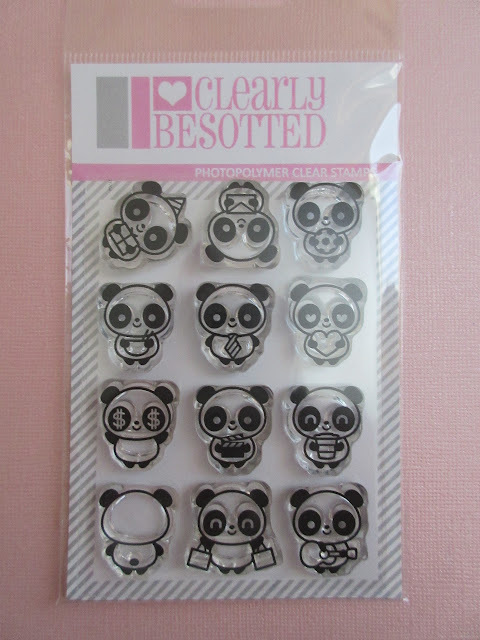 The prize is a Clearly Besotted 'Panda Planner' set of stamps, plus a £15 gift voucher (which was kindly donated by Clearly Besotted). 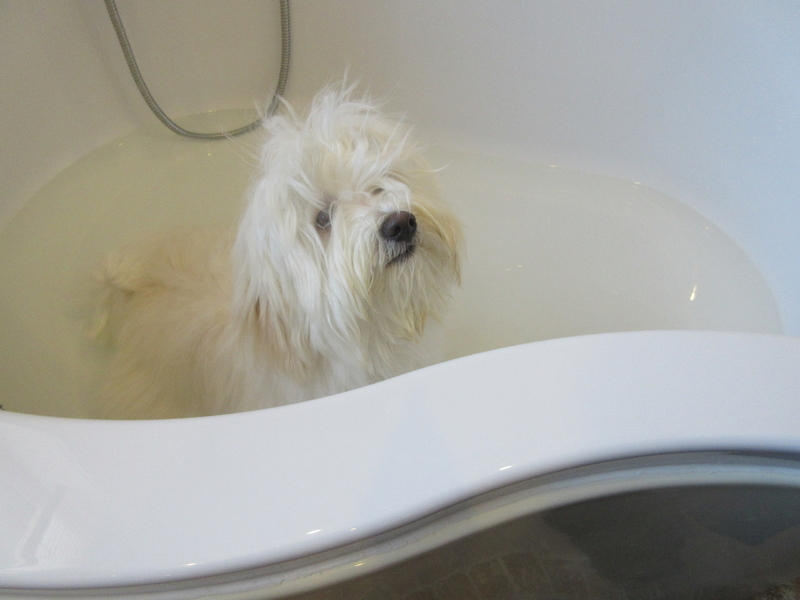 Dudley's hair trim session on Wednesday turned out to be a bit of a saga. The place is a bit off the beaten track on the outskirts on Winchester - I drove whilst Len had Dudley on his lap - doing the usual yodeling act (Dudley, not Len!). And the stupid Sat. Nav decided to play silly games and I/we got hopelessly lost - going round in circles. I knew that, once I spotted the main street of Winchester with the iconic statue of King Alfred, that we were in trouble! Who knew there were so many steep hills and narrow lanes around the City itself. 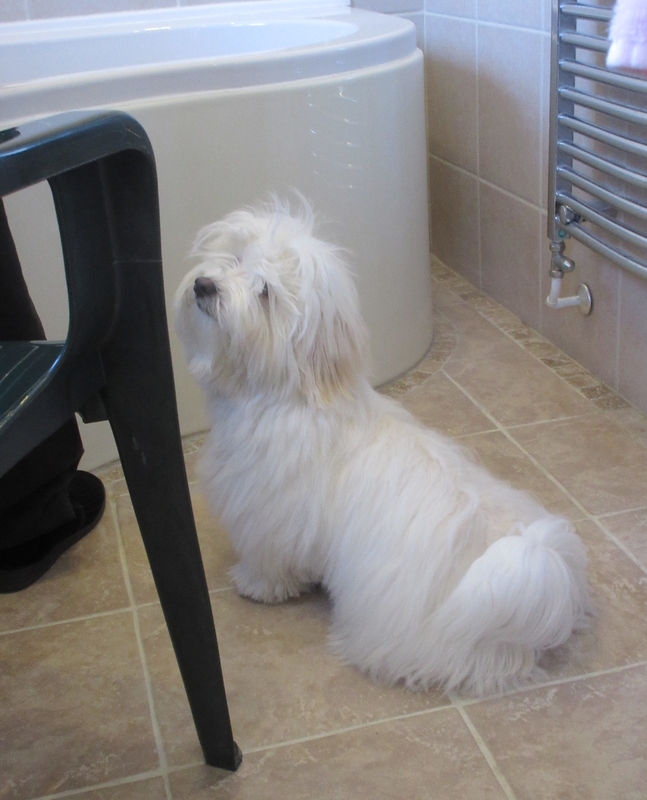 Eventually we did find the place and left Dudley with his Auntie Steph ..... whilst we recovered in a nearby Costa Coffee. As I suspected, he needed a fair bit of work on those matts and the upshot is that we're taking him back for 'Round Two' on Monday morning! So far it's possible that he won't have a puppy cut just yet - but if it means double sessions then it's not fair on Dudley really so we'll see what happens. We're only being charged for one session - but I still have to do that awful 'hunt the groomer' thing all over again! To be honest, it's not a brilliant photo - I've had better chances since but didn't have the camera to hand. This is one of Dudley's favourite places to lie, totally flat on his tummy and cool down - on a bathroom floor with his nose just resting on the landing carpet - so his nose is at the bottom of this photo, hidden by his top knot flopping forward. Legs splayed out behind him and often forming a real starfish with all paws spreadeagled wide apart. He weighed 6.2 kg the other day, so is certainly stabilised at what might well be his fully grown weight. As always, Parsnip and Dudley send their love, and so do I of course! A really special blogger friend just celebrated 50 years of marriage - well done to both you and your lovely hubby. HUGE congratulations! 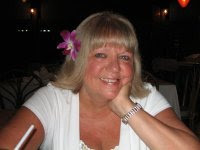 This lady is often my most truthful and yet funniest critic, we've been lucky enough to meet up and she was absolutely what I would have expected - in the best way possible! 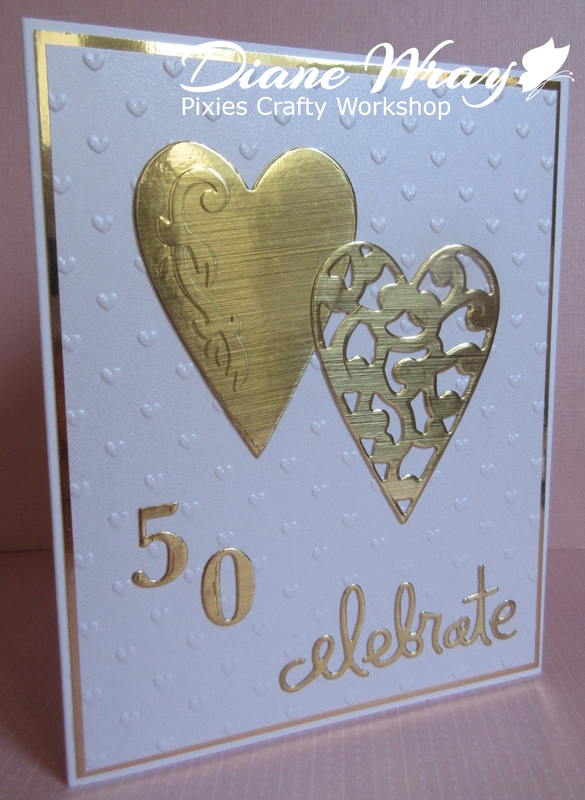 - then a smaller again layer of Centura white pearl card (which is off white in fact, hence the card blank not being bright white) embossed using an X-Cuts 'Polka Hearts' embossing folder. To be fair, I trimmed the embossed layer to exactly where I wanted it after doing the embossing, so the hearts lined up and was just so lucky that it was as I wanted so I didn't need to trim the gold layer or the card blank down - which I often do, to make sure things are symmetrical! OCD - or even 'CDO' strikes again! I seem to have a real rush on right now, needing to make special cards. It's good as it focuses the mind immensely! BUT, Dumbo here got the date totally wrong. The card was made, written and all ready to post when I spotted that I was going to be almost a week late! Instead of Wednesday 17th, the big day was Friday 12th April. Easter is almost here! The local kiddies have already been off school for a week now. Mixed weather for them so far but the past couple of days have been gloriously sunny and quite warm. 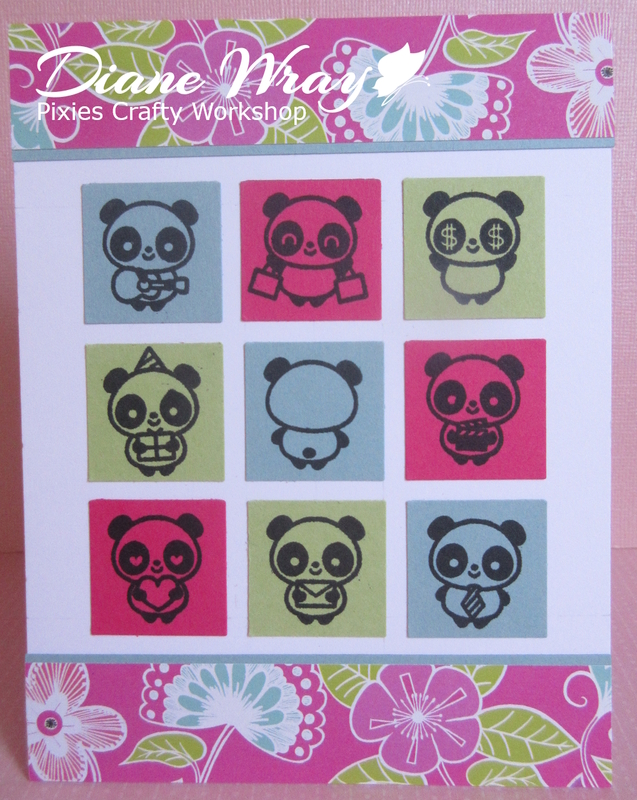 I do so love this sweet little set of panda stamps, some very clever touches in the designs if you look closely (eg. the panda holding the heart has hearts in his eyes) - and there are actually 12 stamps in the set to choose from. So, you could make a lovely little planner with a different panda for each month! I didn't add a sentiment as my box of 'ready finished cards' is sadly very low on general cards. How great was that then, such a lovely gesture. I would like to offer both parts of the prize as one complete prize - betcha all love those dear little pandas anyhow! So you would receive the panda stamps directly from me and I would also forward the Clearly Besotted email onto you for you to use at your leisure - I've checked and there's no time limit on the validity of the gift card code. 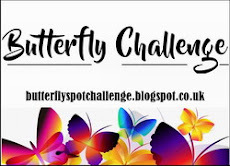 As always, the Snippets Challenge will run for two weeks and the Playground gates will close at 11am UK time on Saturday 27th April. The gates will open again at midnight UK time on the same day. I'm still having a few leftover aches and pains after the dreaded gout - but nothing like it was and each day generally brings a step forward - so to speak, basically it's probably the long term arthritis having a moan! No harm in lying here looking soulful in the hope of more treats is there? What? You're gonna wash my face when I get back indoors? I'll have you know, I worked hard to get it this grubby! OK, point taken. Not too many treats at once - so now I'll just curl up and have forty winks. 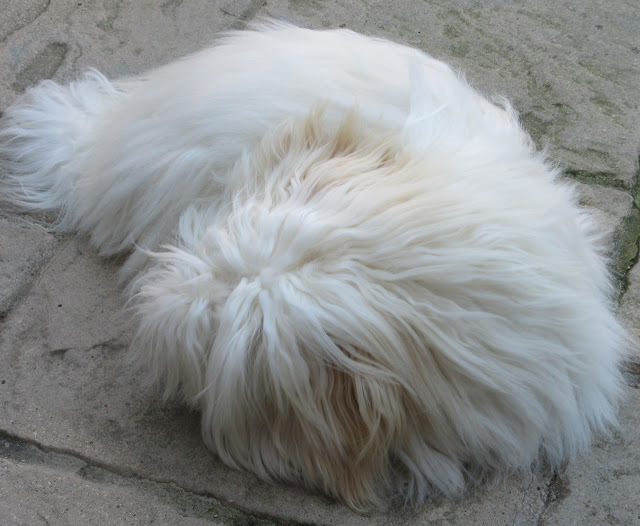 BTW, I know it looks just like a fluffy rug but it really is me - head with peachy ears nearest the camera and tail at the far end. It's my 'isn't he tiny and doesn't he look cute' look! 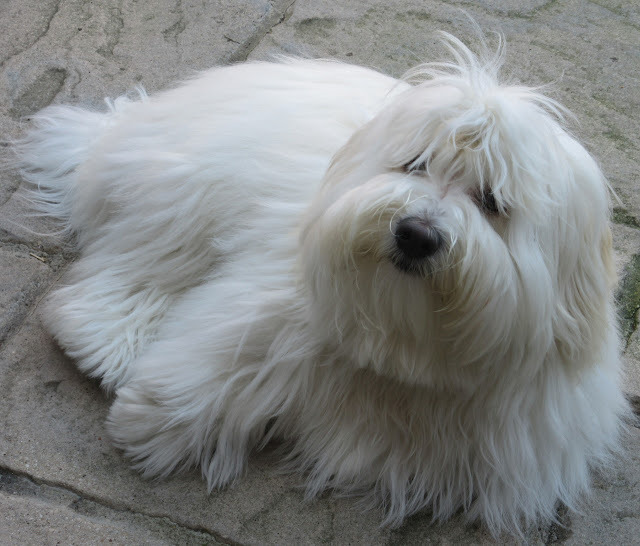 It's true, Dudley does look tiny when he's curled up asleep - on the other hand he looks just the opposite when splayed out on a cool tiled floor like a starfash! And yes, he really does feel as soft and silky as he looks. Len says he's a great accessory for a chap out walking with him - all the ladies stop to coo and make a fuss, of Dudley of course! 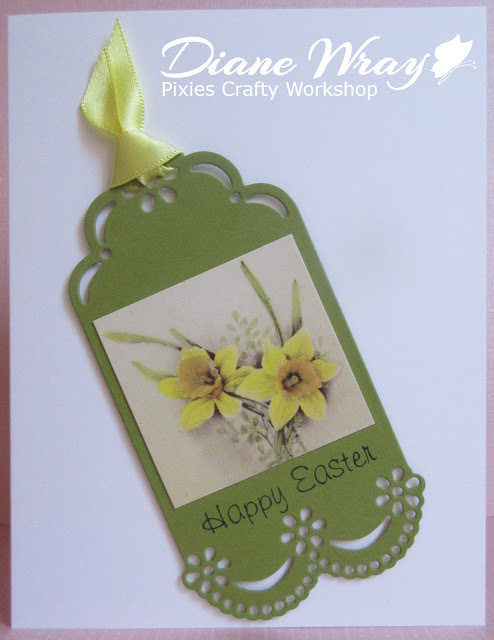 I really love these pretty Easter cards, made by Heidi. 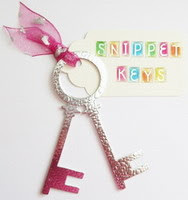 The stamp she used is lovely and totally lends itself to paper piecing to use up a few snippets. Great Spring colours as well! It's never too soon to make Christmas cards and this one is just stunning! Helen brought it to share - and I think it's so elegant. Snippets of gold, and also a snippet of kraft card for the stag - absolutely gorgeous design! 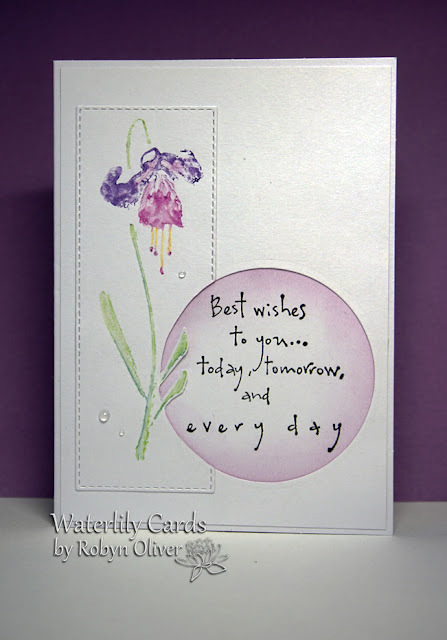 Robyn made this fabulous card and the freshness, as well as that wonderful fuchsia, just called out to me! 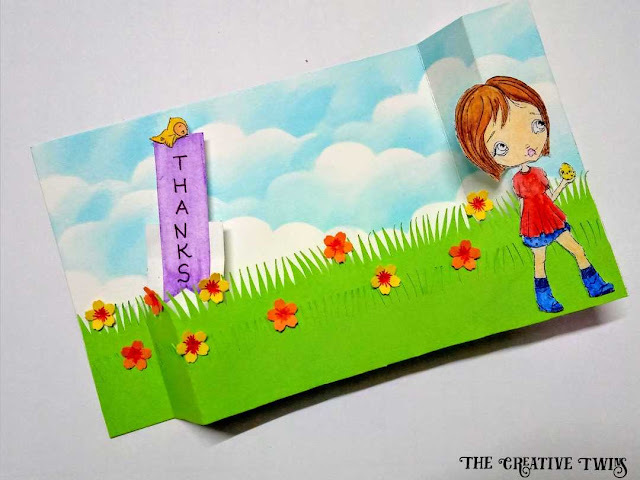 You must go and read how Robyn made the card - there are a few very neat tricks there such as colouring onto the stamp with water colour pencils (something I've never thought of doing, markers yes but not pencils). And the way Robyn added the sentiment circle is also very clever. I just love the Playground for new ideas and techniques to try out! Hi there girls, so glad you came to play and we do hope you come back again soon! So, we had two (three really) new playmates this time and a total of 67 entries. I'm so happy that numbers are really healthy - and of course that you're using up some of those dreaded snippets! I'm pretty sure that Janice is a big fan of 'Clearly Besotted', so this should make her smile a lot when she finds out! Please send me your address Janice, with your full name at the top as well so I can copy and paste or just write straight from the email onto the envelope - for speed and ease. It's also confirmation that you still would like the prize of course and I'll post your prize once I hear from you. Please put Playground Winner or similar in the subject line of your email in case it drops into my junk mail. Email address is on RH sidebar as always and I'll post the prize off to you ASAP this coming week. Remember folks, there's still almost another week to run on Challenge #349 - you can find it HERE. 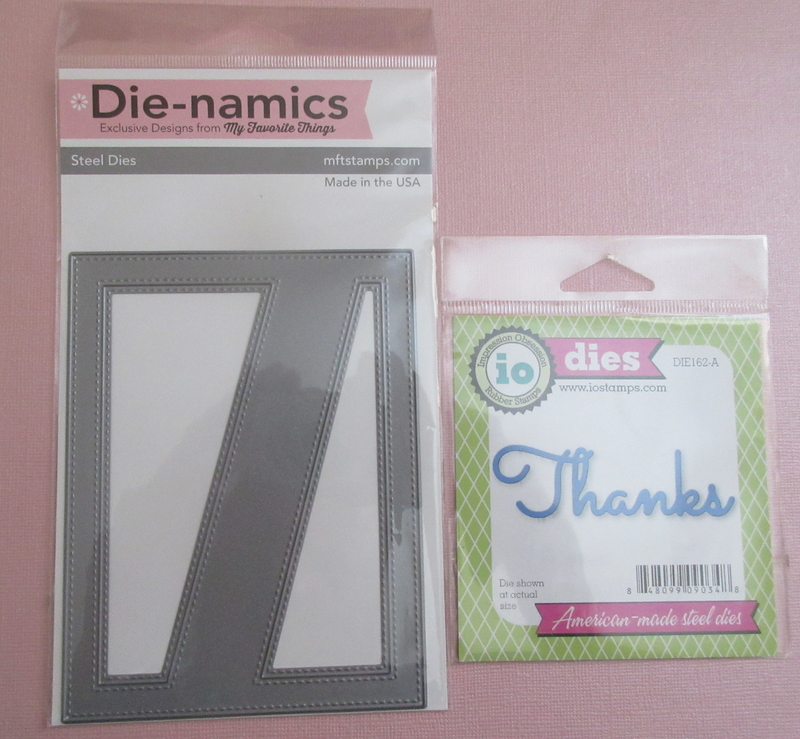 The prize is an MFT 'Stitched Diagonal Cover Up die' and an Impression Obsession 'Thanks' die. And, a few people have commented that they wouldn't attempt to line the stripes up as I did on my 'sample snippets card' for challenge #349. The thing is, that's exactly why I lay in bed pondering just how it could be done to always work without fail. And, by following my little instructions below that card - I promise you it WILL always work. Basically you're cutting the sentiment die in exactly the right place, every single time! In a way, it's a bit like cutting a sentiment into a patterned piece of paper to make a 'camouflage' card. And those always line up perfectly don't they? Afraid there's no new photo of Dudley this time round. 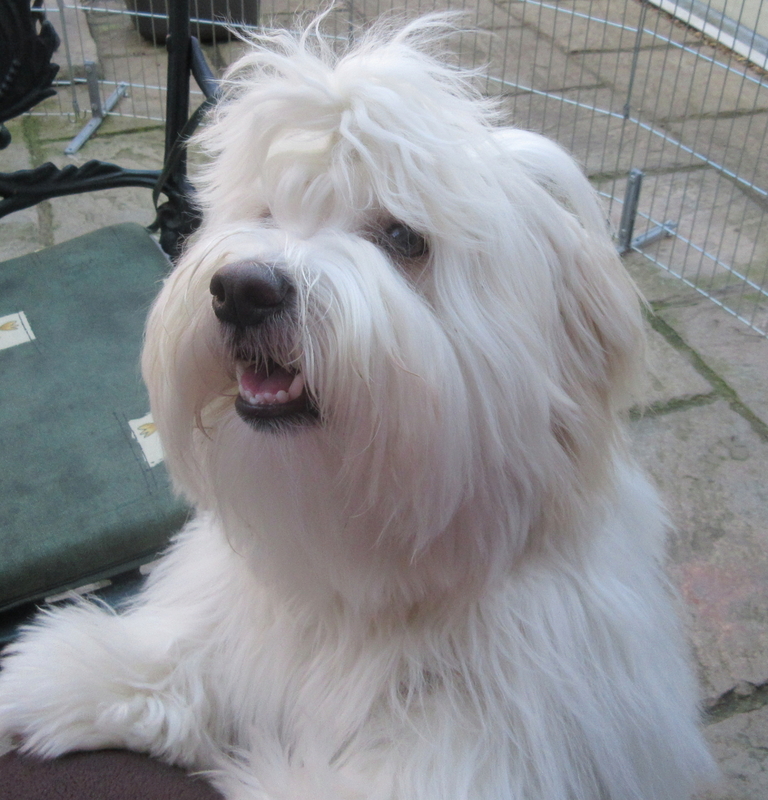 He's booked in for a grooming session on Thursday so I'll try to take a photo - once he's back home looking all freshly bathed and groomed. 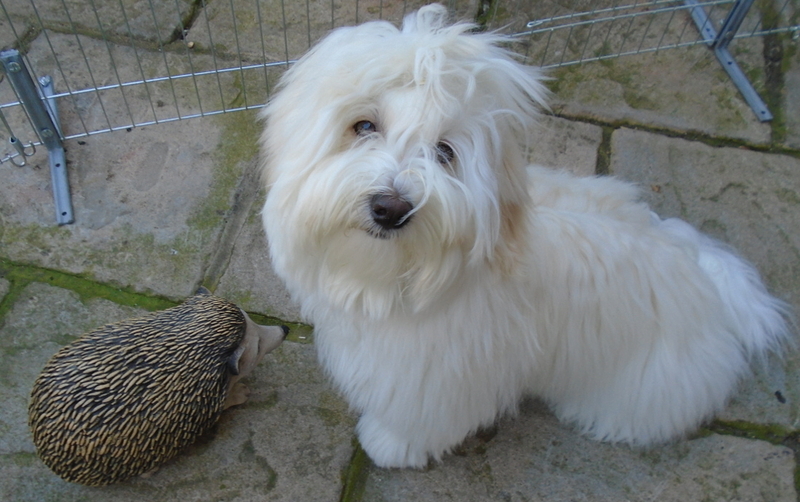 The hedgies are still visiting each night, and somehow they've avoided being around when Dudley goes out for night time toilet trips - amazing really, but no doubt it'll happen as time goes on. And lastly, I'm almost back to how I was before the dreaded gout - hooray! My GP has agreed that I need to go onto preventative medication, after giving things a further month to totally settle down. Phew - although it isn't infallible, it's the best option there is. Despite Mr Mojo taking a hike here, I was determined to join in with ScrappyMo's Rudolph Days challenge which runs until the end of this month. 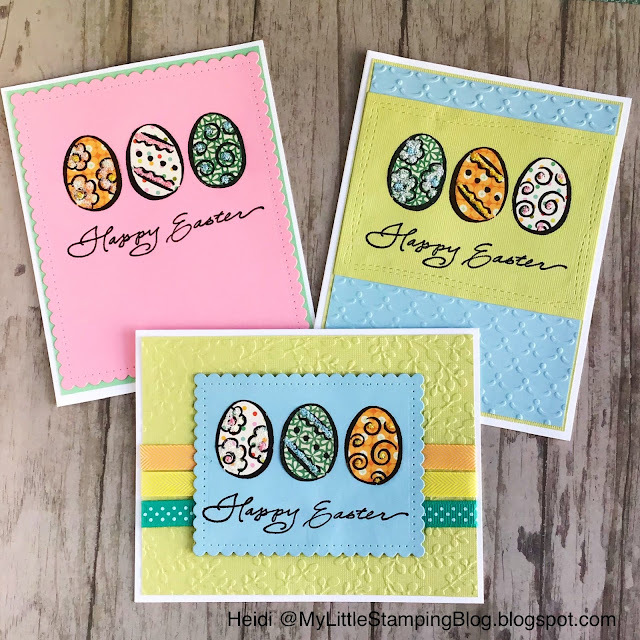 I got this idea from another blog and am so grateful to Dawn Griffith who is a Stampin' Up Demo lady, she made it all so easy - easy enough for me to make four the same as I was at it! Her blog post is HERE as well as a link to a video Dawn made. Dawn did use a length of narrow ribbon along the lower part of her card but to be honest, not only was I short of the silver ribbon, but I thought the card was fine without it. She also changed the coloured layer for dark blue and also soft baby blue on other cards using the same design - all of which look lovely! Thanks Dawn!